What's the Best Way to Teach Kids LGBTQ People Exist? A new guide for discussing LGBTQ relatives with kids is actually more helpful for grown-ups. In a world where differences in politics and belief systems can run deep between family members, the book Rainbow Relatives: Real-World Stories and Advice on How to Talk to Kids About LGBTQ+ Families and Friends is a refreshingly lighthearted, humorous, non-scientific (and non-partisan) approach to answering kids’ questions about their LGBTQ relatives. 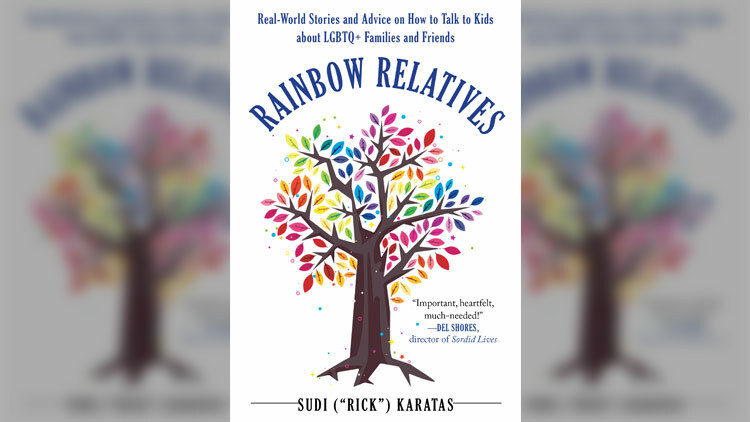 Though some experts and therapists are interviewed in the book, gay author Rick “Sudi” Karatas primarily gives advice through heartwarming, and often hilarious, real-life anecdotes from those who have been through these experiences — and lived to tell the tales. Karatas, an actor who has appeared on One Live to Live and The Sopranos, is also a producer and writer. He was inspired to create the book while having a conversation with his sister, who lives in another state. In the book, topics range from light — like comedy writer and Hollywood Squares alum Bruce Vilanch quipping on being godfather to some 40 kids — to more serious, like country singer Chely Wright speaking on battles yet to be won in the queer community. And it’s not just celeb interviews. Rainbow Relatives is broad in its scope of stories, including numerous narratives from “regular folks,” like a woman who had to tell her children that their father is gay. Throughout the book, Karatas uses humor to dive into the deeper and often painful areas of the LGBTQ experience, like bullying and family rejection. Chapter titles like, “There Was No Monster In Your Closet, But Your Uncle Was,” “Kids, Your Father, Well, She has Something To Tell You,” and “Daddy Left Mommy For Tommy,” can certainly help break the ice and pave the way for more serious family conversations. “Unfortunately, although a lot of progress has been made for LGBTQ rights, there are still many issues that need to be addressed,” says Karatas, stressing that in many ways, a book like this is needed now more than ever. Of course, it’s the parents who often need the book more than their kids.